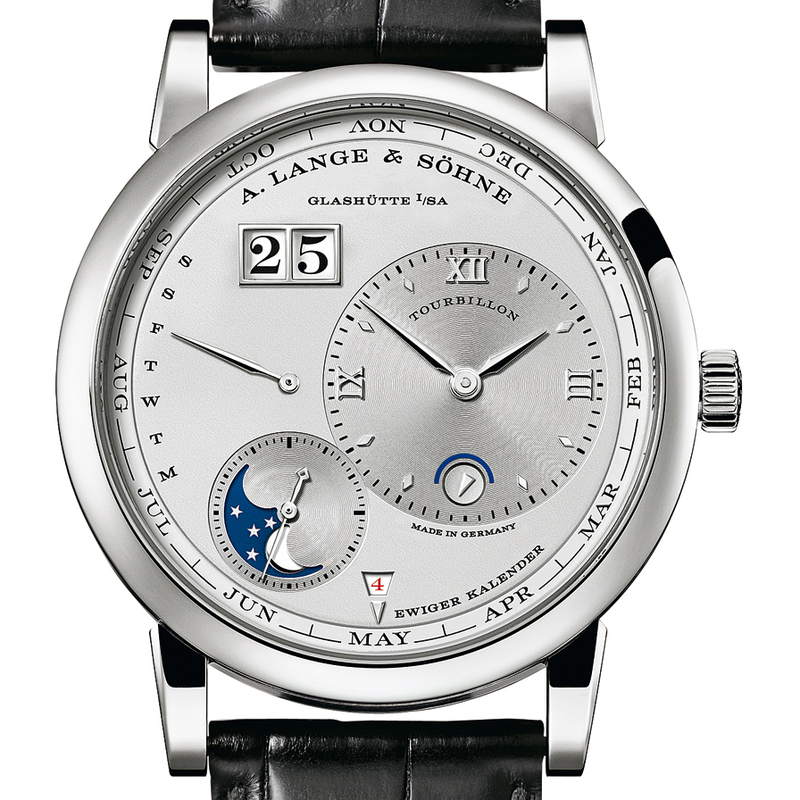 The 2012 TimeZone Watch of the Year finalists represent the best timepieces of the year. The winner is chosen exclusively by the TimeZone community, the world's largest community of wristwatch enthusiasts. The Chronom�tre Optimum incorporates exceptional components for the first time in one watch: two barrels in parallel, the constant-force remontoire, the revolutionary EBHP High-Performance Bi-axial Escapement (patent EP11405210.3), and the natural dead beat second. The extraordinary technical expertise of this watch advances the art and science of horology towards complete precision timekeeping. 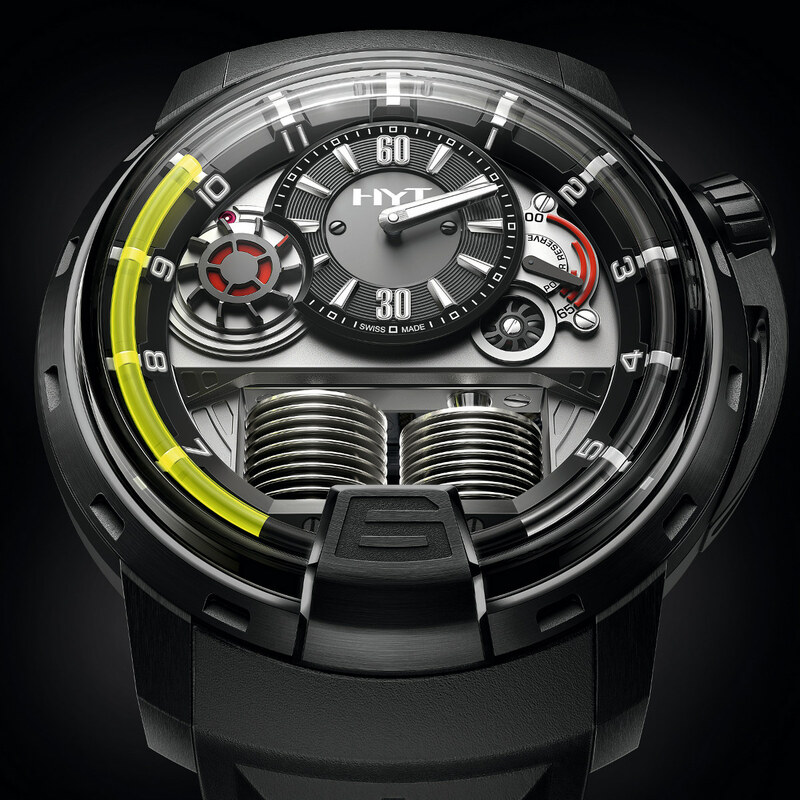 The H1 by HYT incorporates liquid into a mechanical wristwatch. Two reservoirs are located at 6 o'clock. With each passing hour, one reservoir compresses while the other expands, pushing both clear and fluorescent liquids through a tube. The half-moon meniscus marks the boundary where the two fluids meet to indicate the hour. At 18:00, the fluorescent liquid returns to its initial position in a retrograde movement. 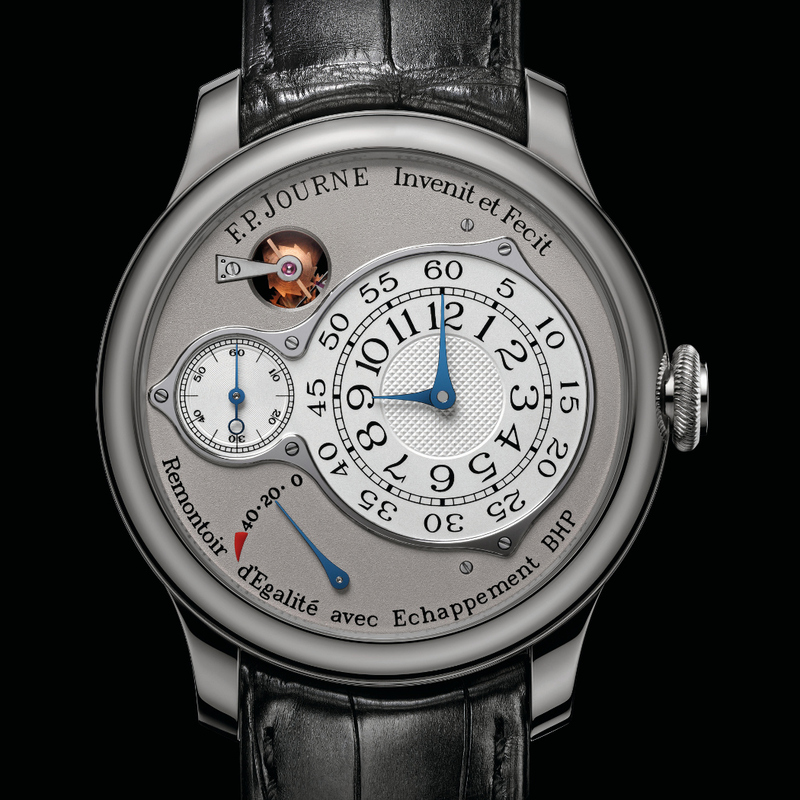 The minutes, small seconds wheel and power reserve indicator are located in the upper section of the dial. 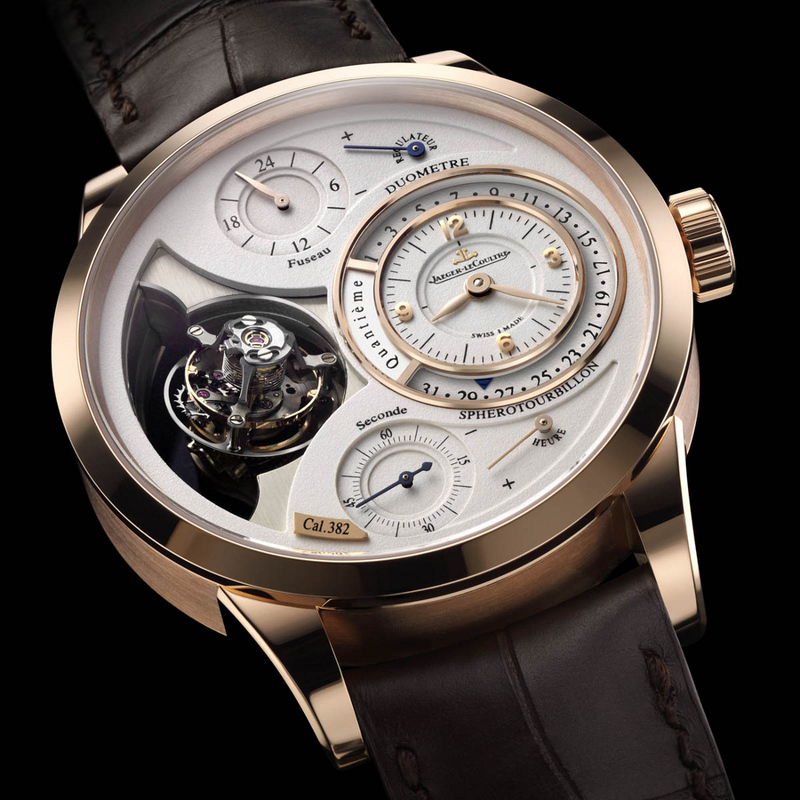 The Duom�tre Sph�rotourbillon is equipped with a spherical double-axis tourbillon. In addition to the axis of its carriage, the Sph�rotourbillon has a second axis inclined at 20� to achieve a three-dimensional rotation movement. The revolutionary `Dual-Wing` concept featured in Calibre 382 makes this exceptional model the first tourbillon watch that is precision adjusted by way of its small seconds flyback system. The RM 056 Tourbillon Split Seconds Competition Chronograph FM Sapphire exemplifies the brand with its modern movement architecture and a case completely machined from sapphire. The movement is not only modern in its design, it also employs cutting edge materials such as titanium in the baseplate, titanium column wheels and even aluminium in the central bridge. The sum of these are an effort to reduce weight. The movement is a split seconds three-register chronograph with tourbillion, which is just about the most complex mechanical movement to make. This sophisticated movement is then paired with a tripartite case cut and milled from solid blocks of sapphire. The production of this sapphire structure took years of research and testing in order to ensure an adequate response to the demands of strength and comfort. Creating the case took over 1,000 hours of machining, including 430 hours to pre-form the case components and 350 hours to polish the entire case. For excellent optical properties, both the front and back bezel are treated with anti-glare. Calibre RMCC1, 35-jewels, hand-wound, 21,600 vib/h tourbillon movement with hours, minutes, split-seconds chronograph and power reserve, torque and function indicators. 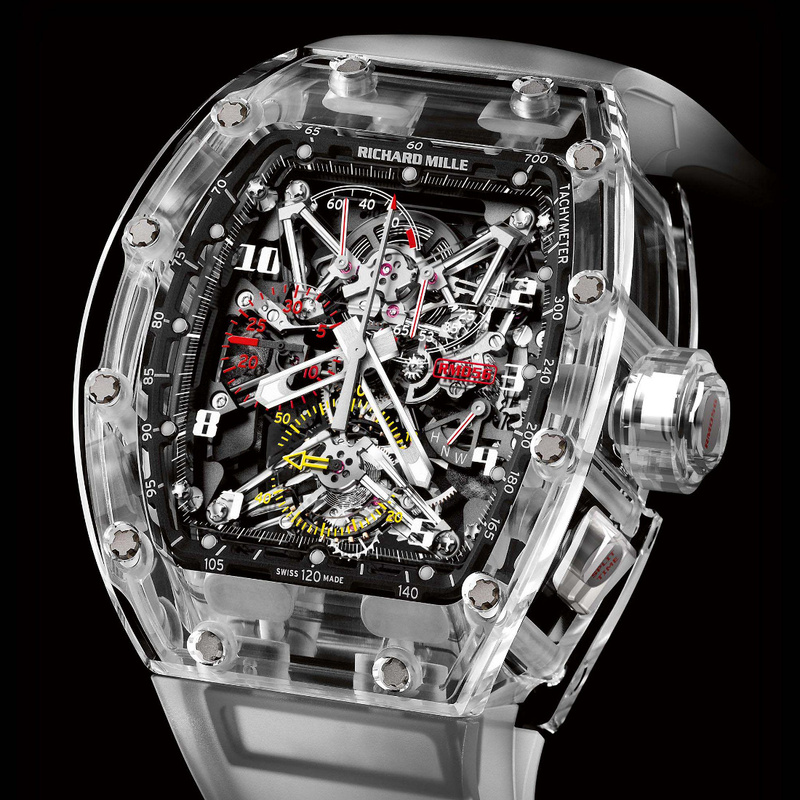 Skeletonised titanium baseplate, column wheels in titanium, central bridge in aluminium, balance wheel with variable inertia, fast rotating barrel, barrel pawl with progressive recoil and 70-hour power reserve. Sapphire with anti-glare coating on both sides, protected by 8 silicon clamps inserted in the outer and inner grooves. The innovative Oyster Perpetual SKY-DWELLER features an annual calendar and dual time zones. The local time is read via centre hands and a reference time display in 24-hour format is read via a rotating off-centre disc. 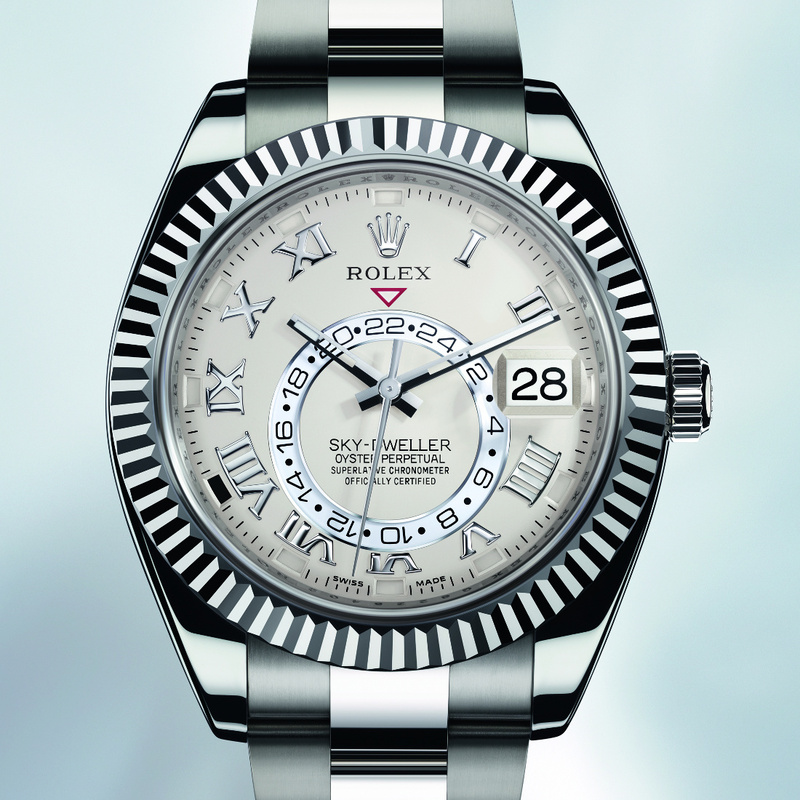 The SKY-DWELLER is the first annual calendar by Rolex. The annual calendar requires only one date adjustment a year, when the month changes from February to March. The month display is configured in 12 discreet apertures around the circumference of the dial. The patented bezel-operated control ring allows quick-setting of the date, local time, and reference time from the crown. Centre hours, minutes and seconds hands 24-hour display on off-centre disc. Second time zone via independent rapid-setting of the hour hand. Instantaneous annual calendar at 3 o'clock with SAROS system and unrestricted bidirectional rapid-setting of the date. Month display via 12 apertures around the circumference of the dial. Stop-seconds for precise time setting. 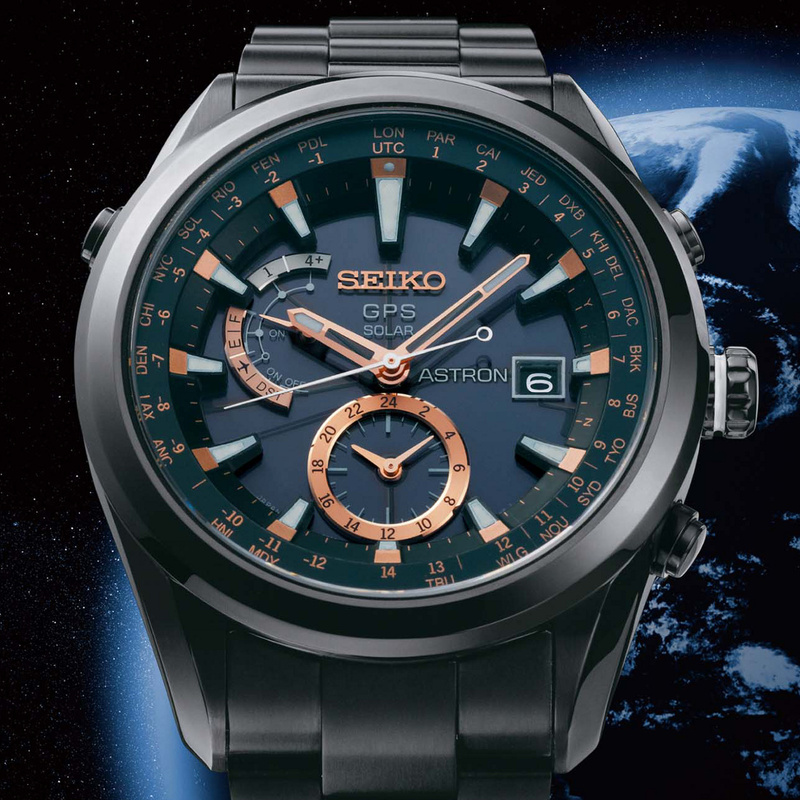 The Astron GPS Solar is the world's first analog GPS solar watch. The Astron GPS Solar is a highly technical, feature-rich timepiece that can be synchronised to atomic clock precision and is accurate to less than one second every 100,000 years by just one button operation anywhere in the world. When reception is clear, the Astron GPS Solar also automatically adjusts the time once per day. The perpetual calendar is correct to the year 2100. Only Astron offers full coverage of all 39 distinct time zones. All this technology is powered by a high-efficiency solar battery that absorbs light through the dial. Although the case diameter is a sizable 47 mm, Seiko achieves a comfortable weight through the use of a ceramic bezel and either lightweight high intensity titanium, or a stainless steel case paired with a silicon strap. Hours, minutes, seconds, perpetual calendar date. Signal reception result indication. World time function (39 Time Zones). Daylight Saving Time function. In-flight/power save function.